Apple's metal link band for Apple Watch is great, but the massive price tag puts it far out of reach for most people. Nomad is giving users a more affordable option, that is still high on style as well as quality. 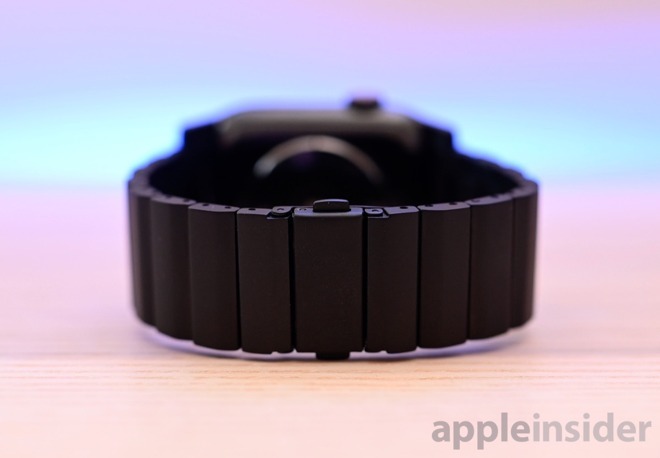 We've covered our fair share of Apple Watch bands, but few metal ones. Leather, nylon, silicone are all in high supply, but metal link bands are largely left to Apple. Nomad has designed their new titanium band to fill that void in the market. It comes in both black and silver, and has a very slight taper along the band. Nomad kept branding minimalistic by only including a small, subtle logo on the side of the clasp. This isn't just promotion or adornment, but functional as well, because it offers a waypoint for orientation when putting the band onto your Apple Watch. The clasp used is quite thin which goes a long way to ensuring a comfortable fit. 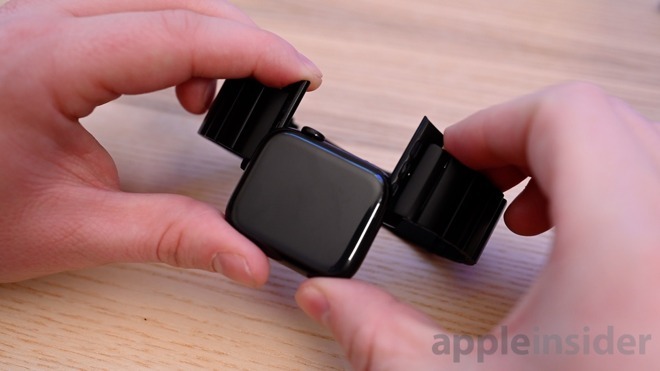 It stays very flat and doesn't dig into your wrist while wearing day-to-day. It opens easily by squeezing two buttons on either side of the clasp. If you've tried on any of Nomad's existing silicone or leather bands you're already familiar with the lugs they are known for. 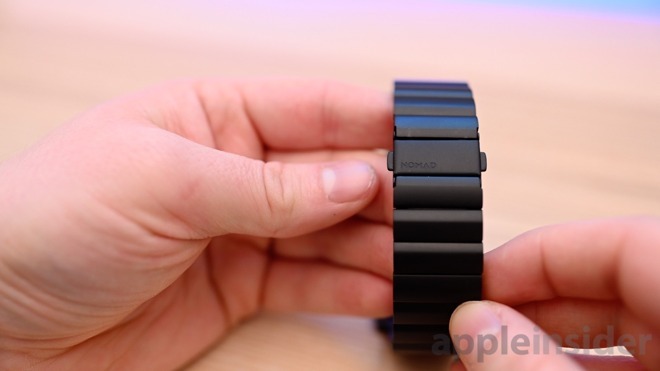 They are boxier lugs that contour to the face of the Apple Watch and give the watch a slightly larger look. The style is so popular a number of other manufacturers have knocked these off for their own bands over the past couple years. Apple invested a lot into creating easily removable links that operate by depressing a small button on the back of the link. When resizing the band, you can quickly remove the necessary links then snap the whole thing together. One of the largest differences between Nomad's offering and Apple's own metal link band is the way it is resized. For a task that you will likely do merely once during the life of the band, it is tough for any company to invest that much time and effort into such a mechanism. That equates to removing links from Nomad's strap the old-fashioned way. Each link has a pair of pins holding them in place. When you want to resize the band, you force a pin out, remove the necessary links from each side, then reinsert a pin to connect it back together. You can take this to a jeweler or watch seller to have this done, but you can easily do it for yourself since Nomad is including a tool to do with each band. Just loosen the tool, place the link into the tool with the arrow facing away from the tool's pin, then slowly tighten the screw. This will force the pin to extrude from the opposing side, and extracted by hand. It isn't a difficult process to undertake, but it is far more in-depth than Apple's solution. And, it is a one-time process. My wrist seems to fall between having four or five links removed with one being ever so slightly too big, and the other ever so slightly too small. This is one of the downsides to bands that have discrete fit options whether it is Nomad's metal link strap or Apple's Sports Band. We mentioned Nomad has custom-designed the band from the ground up including the lugs and individual links. The tolerances on the band are quite tight, which has an unfortunate impact. There is very little lateral movement of the band, so if you remove more than a couple links, you can't put the band onto the Apple Watch one end at a time. 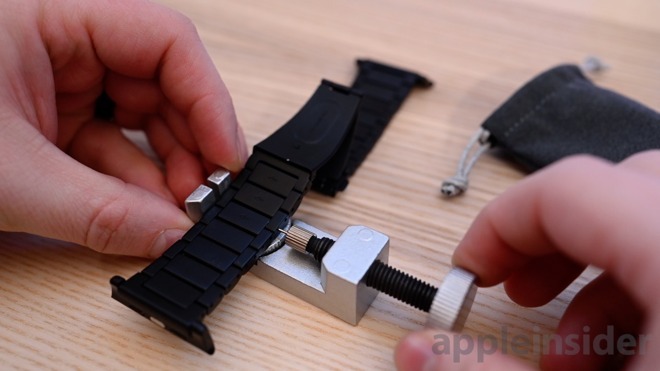 Instead, both lugs must be inserted into the Apple Watch simultaneously. But, it sounds more awkward than it is. All of us at AppleInsider change our bands a lot, between professional obligations, and personal ones. When I'm not trying something new, I opt for leather or metal bands during the day, then I switch to a nylon or sports band for hitting the gym. Originally I kept trying to force the Nomad band into place one end at a time, but when I tried to put in the second side it would bend the clasp. Once I started putting the band on correctly, it became a non-issue. Creating a metal link band is tough. 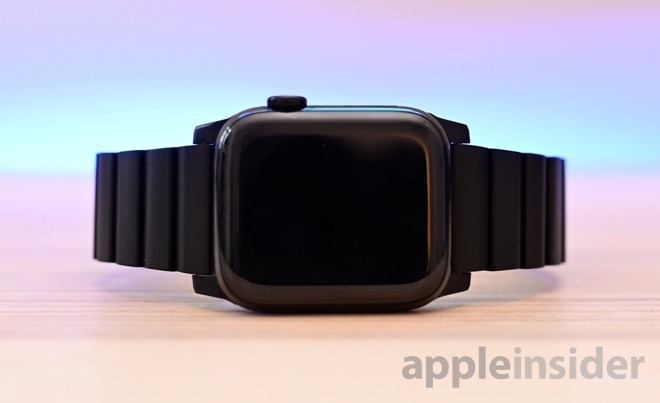 Even years after the Apple Watch release, options are limited to normal watch bands that just have Apple Watch lugs tacked onto them, dirt cheap bands that have black paint come off within hours, or the couple metal ones that are available which are usually lightweight aluminum. Making a black model band is even harder than making the silver. It is difficult and expensive to make stainless steel black as Apple does. This results in companies using too-light anodized aluminum, or cheaply painting steel which looks good at first before it comes off, or releasing only in silver. Nomad going for titanium is a great choice because it is strong, but still lightweight. It isn't as light and cheap feeling as aluminum but not as hefty as steel. For those opting for the black version, the black coloring should hold up well over time. In our testing, we did have a very small amount of silver show through on the corner of the underside of the band where our wrist makes contact with our keyboard. When we reached out to Nomad, they said I likely had a defective unit and that shouldn't happen. We also type over here at AppleInsider more than most so it could also be a workplace hazard. We'll be talking more about this in the future. Apple's link band is amazing, but it is far too expensive to be practical. Nomad's band looks great, is well built, and has a unique design that sets it apart. If you've been yearning for Apple's band, Nomad's is certainly worth a try. The links may not be as easy to replace, but it that is a small downside for the significant savings you get by going with Nomad. When rating this band, it all depends on the context by with you measure it. Compared to nearly every other Apple Watch band on the market, it knocks it out of the park in looks and quality. Compared directly to Apple's however, it falls short with its rigid architecture for putting it on and the tedious method of removing links. Nomad's new titanium Apple Watch band is available now in black or silver for the 42/44mm models. You can pick it up directly from Nomad's site for $179.95.